As these two upcoming big blockbusters will be released worldwide in just a few weeks time, Warner Bros. Pictures invited the media for special screening of the titles’ preview footages. Now, now, don’t misunderstand. They didn’t show the whole of those movies, just 10 to 20 minutes of the actual scenes from the final cut of the films. I was initially very excited for Godzilla, and not so much for Edge of Tomorrow, but at the end of the screening, I find myself disappointed from what I’ve seen from Godzilla‘s footage, and surprisingly more impressed with Edge of Tomorrow‘s instead. The footage shown was bound to disappoint as it was like watching only the first 10 – 12 minutes of the film without a glimpse of how the fun, thrilling parts are going to be. Of course, I didn’t expect them to reveal the great titular monster just yet as it’s sort of going to be like Cloverfield, but it certainly failed to intrigue me any further as it didn’t show how the film’s going to entertain the audience, and plot wise, it didn’t show me what I couldn’t already figure out from the trailers. Basically, it was like watching a longer teaser trailer. Its story seems to have very similar formula as most disaster science-fiction flicks, like 2012, World War Z, War of the Worlds, Independence Day, just to name a few, where characters are separated from their family to save the world. One of the main characters, a seemingly important nuclear physicist and plant engineer named Joe Brody played by Bryan Cranston (Breaking Bad), and his wife, Sandy played by Juliette Binoche, get called in because “something” is happening at the Janjira Plant (didn’t quite catch what it was, but basically the radiation plant is going haywire) and it requires their attention. They go there to either investigate or fix the problem but it ends tragically with Sandy dying and the entire city or island, I think, exposed to the deadly radiation that killed her. 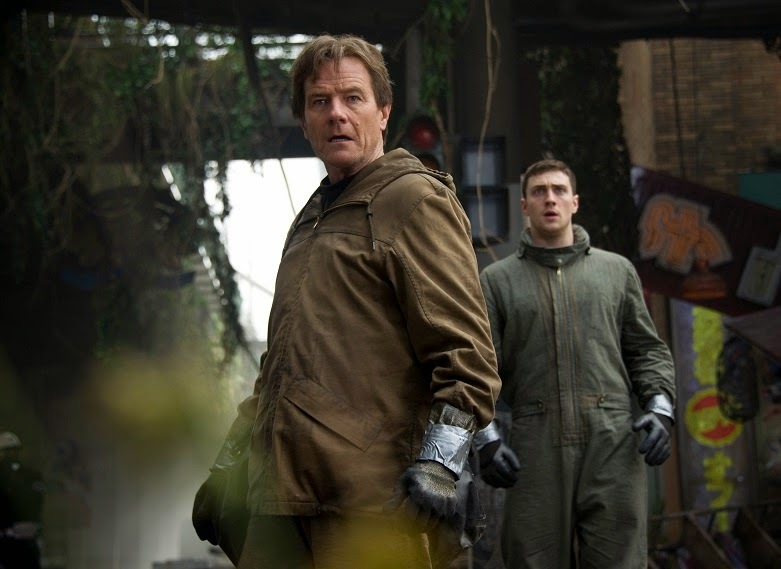 Many years later, Joe revisits the city/island, now a fully evacuated exclusion zone, with his now-grownup son Ford, played by Aaron Taylor-Johnson, to investigate if he was the only one responsible of what happened. He removes his oxygen mask as he sees plants growing around and his device detects almost no radiation. The footage ends by showing buildings destroyed in peculiar ways and a part of the city seems to be filled with the military, which is revealed in the trailers that Ford will be joining. So it is sort of obvious that the entire evacuation due to radiation might be a setup by the government to cover up the whole monster situation. Now the footage shown for this title was with more purpose. It showcased the amazing visual effects, cool action and the rather compelling plot although it doesn’t feel very original, like a ripoff of Starship Troopers and Source Code. The length of this footage was so long that it felt like I’ve already seen half of the film, and at the end of it, it only left me wanting more. I was like, come on, I’m sold, just let me watch the entire movie now! If I could be entertained by these cutscenes alone, I think the whole thing’s definitely going to be a fun ride. The role seems to be perfect for Tom Cruise as well. 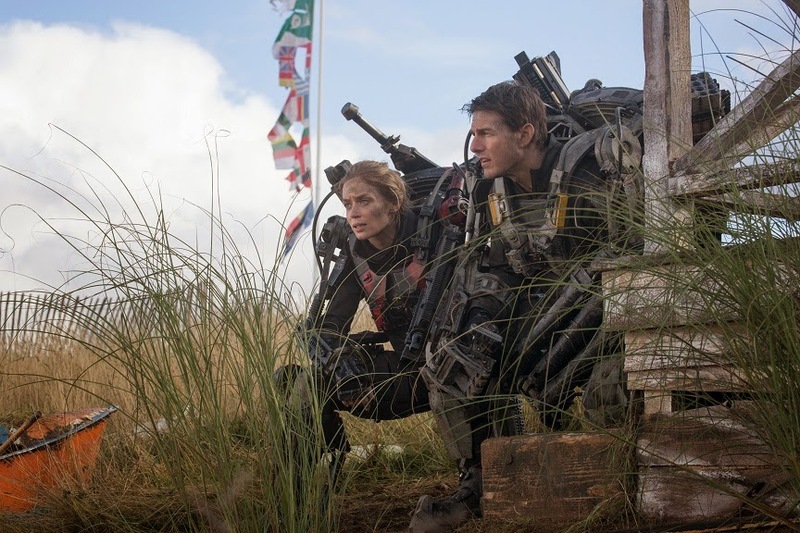 Anyway, here’s what was shown in this preview footage, much like the trailers we’ve seen so far, Tom Cruise’s coward-ish character Bill Cage gets stuck in the time loop where every time he dies, he wakes up being unwillingly drafted into the army for the war against aliens. After looping so many times that he’s memorised everything that’s going to happen, he takes a different route to survive longer and meets the more experienced soldier Rita Vrataski (played by Emily Blunt), who used to go through loops like him and has lost “the gift” to do. She trains Bill Cage to improve his battle abilities and kills him to restart the loop whenever he does not achieve up to her expectation. Eventually they go to battle together and go very far but only to a point where Cage reveals she’d die no matter what they do from here, except the survival route that she refuses to take as she’s to determined to win the war in that very mission. The preview finishes here, leaving me to hope that there’ll be a good twist at the end of the film, and I’m sure there’ll be one considering that the film is based on a popular Japanese novel (All You Need To Kill). The scenes of the battle zone are just spectacular, like they’re right out of a video game, but with way better graphics.